The road is ours for the next seven days but we won’t be doing it covertly that’s for sure. 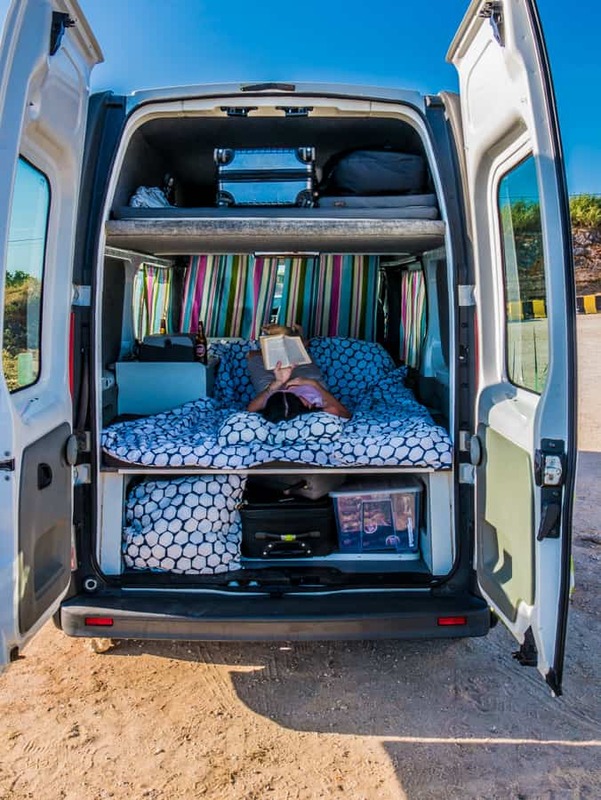 Our ride for our road trip along the west coast of Portugal will be as bright, vivid and full of life as our brightly painted West Coast Campers campervan. The Hang Five pushes out onto the freeway. The stainless steel cables of the impressive Vasco da Gama Bridge are now a scene in our rear vision mirror, as we leave the city of Lisbon. It’s time to see where the road takes us, with no real plan other than to be in Porto in a week’s time. Portugal is a very easy country in which to do a road trip. There is approximately 830km of coastline that borders the Atlantic Ocean and 1,200 kilometres of a land border shared with Spain. As the crow flies, it’s a very rough 800 km from north to south and only about 200km wide. It’s small and therefore the distances required to have a good road trip are minimal. For a really cool visual representation of how the size of Portugal compares to your own country, check out this country comparison website. The driving is also relatively easy, with only a few locations that have any form of hills, mountains and winding roads. Certainly, on the west coast, this is limited. This allows you to cover a lot of distance, if you wish, or to take it much more slowly. Road trips in Portugal are easily done by car, but we chose to do ours in a campervan, of course. The duration of the road trip and the small distances that we were going to be travelling meant that we only needed a smaller campervan this time. It was of a similar size to the campervan we used on our road trip in Iceland. Our trip started in Lisbon, in the south of Portugal. Driving from Lisbon to Porto in a campervan makes for a perfect road trip for 8 days. We didn’t want to lose any of those days by having to return the campervan back to Lisbon. West Coast Campers made this easy by providing the opportunity to pick up and drop off in two locations, for a very reasonable fee. We caught a train from Lisbon to the Gare de Oriente train station and then an Uber to the depot. This was all easy enough. Across the 8 day itinerary, we only drive 730km. Only one day was above 200km and several were well under 100km. When you look at the country map further down, you’ll see just how much coverage we made over Portugal, despite only driving such short distances. We made very few plans for the Lisbon to Porto road trip. In fact, we had our pickup and drop off date and that was about it. We knew we wanted to spend two days in Porto and venture into the Douro Valley, but that was all. The rest was “as it comes”. The friendliness of the Portuguese people and the way in which they welcome visitors doing road trips makes it all the easier. We travelled in peak season and still, we found it very easy to pull up in some incredible locations along the way. We never stayed in a campsite for the entire duration. It’s mid-afternoon by the time we leave the campervan depot and finalise our shopping at a local supermarket. The “fridge” onboard our campervan isn’t really a fridge so we can’t stock up like we normally would if we were driving through France in a motorhome. Our destination for the first night is only around 60 kilometres away, at a coastal town called Cascais. We get our first sense of Portuguese driving at this stage. Stirling and I are locked in a battle as to whether it’s improved from when we were last here in 2004. We decide there has been no marked improvement and they must be put on an amber alert, especially when merging onto the busy highway. Driving down the middle of two lanes seems to be a favourite, as does doing 30km under the speed limit. Wooden boats bob on the water, resplendent in their bright colours. They are a floating throwback to the days when Cascais was an important fishing village, west of Lisbon. Then along came King Luis, back in the 1830s and life in this tiny town got a lot more privileged. His contribution whilst he made the town his summer seaside retreat was to inspire a generation of opulent architecture, much of which is still here today. A quick drive through the small streets surrounding the centre of town showcases many large mansions. The historical feel continues throughout with nary a highrise or modern building to be seen. The old fort sits high on the rocky cliffs at the entrance to town and many other grand 19th century stone buildings line the waterfront. 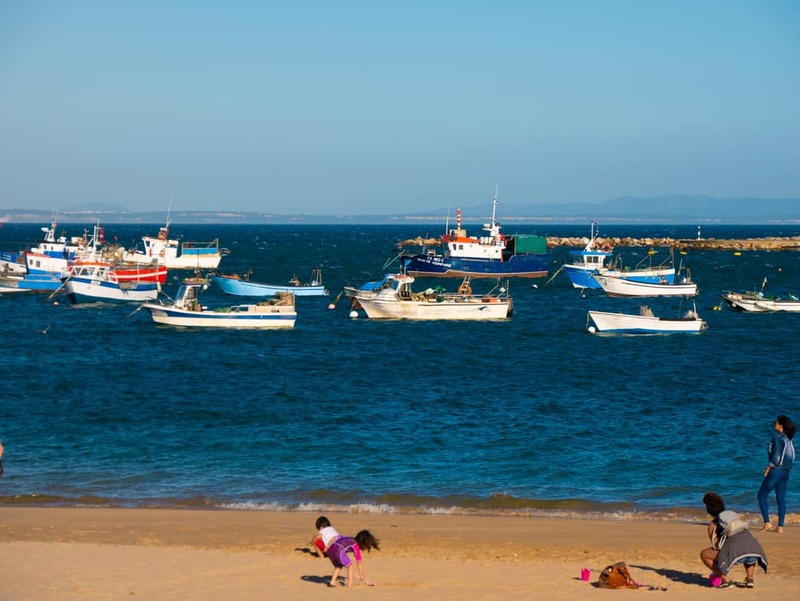 Cascais also has the best of both worlds when it comes to beaches. The calm beach of Carcavalos is on the protected eastern side of the bay. Guincho caters to the surfing crowd and their love of big waves. The streets and cobbled laneways behind the beach are filled with boutique shops, wine bars and way too many English pubs. This is, after all, a tourist town and it’s very easy to see who their primary market is. Still, it’s quaint, very well maintained and shows off the old buildings in deserving style. This is Lisbon’s playground. It gets extremely busy here in summer. It’s also the home of some of the rich and famous. If you are planning on booking a hotel, book well in advance. Normally we might find that a town this small, and this popular would be less than appreciative of the value that motorhome travellers might bring to their community. Not so in Cascais, where excellent daytime and overnight parking facilities are provided, just a few kilometres out of the city centre. At Parque Praca de Touros, (translates to Old Bullring) there are 153 generously sized, hard stand parking spaces. There’s a smattering of trees around to give it a nice feel, and it’s not on a busy main road. Best of all, it’s free. There are cycles that you can hire at the front and a local bus also stops by here. We walked into the city, but I would only recommend this for those without any mobility issues as it is a reasonable walk. We drove the 20 kilometres or so to Sintra, a town with a huge reputation and on the must-visit list of anyone who visits Portugal. 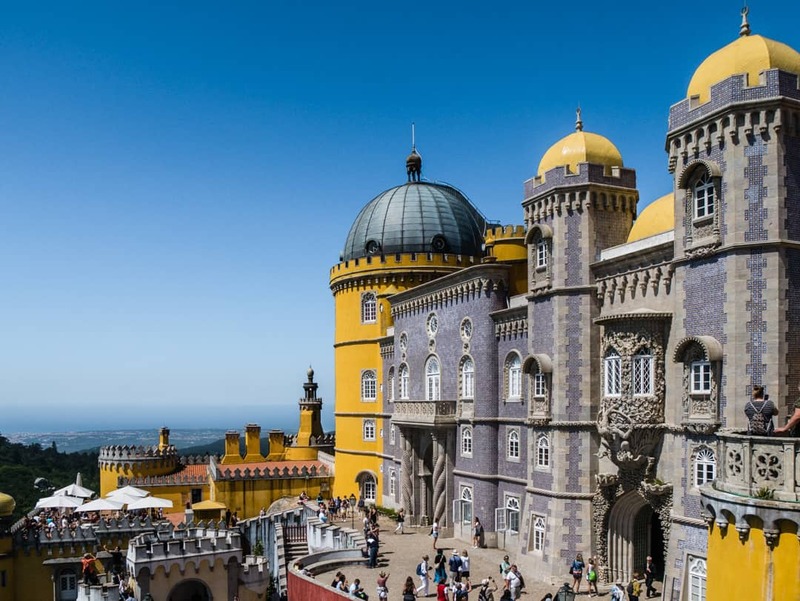 Sintra is home of the famous, colourful Pena Palace and many other impressive palaces and castles. There’s also a number of other things to do here, but Pena Palace is the drawcard. I’d set us a challenge this day. All of my pre-reading about access to Pena Palace didn’t hold out any great hope for those who drove here. We’ve come across a few places like this as we’ve travelled around Europe in a motorhome, and honestly, it’s a pain if you aren’t prepared, or can’t handle the pressure of finding a park. However, I also don’t like to take these comments always at face value, as sometimes people who write this kind of thing, aren’t always honest. Therefore, I wanted to check it out for myself, so that I could write an honest appraisal of the situation. So, we set off early, to allow us enough time to get there, survey the town and surrounding areas for parking options and then get ready to spend some time at Pena Palace. As they say, “the best-laid plans…..” Ours were thwarted very early. Luckily, early enough for a good recovery though. The road to Pena Palace is well signed, up to a point. As the palace actually came into view, we followed a dodgy sign on a tree that I think once pointed the way it should have, but now points to a rather interesting road. With a huge tour bus up our clacker, there was no time for decision making so down this road we went. It didn’t take long to realise we weren’t on the correct road, taking a tour of the city and the railway station once more. The next time around we were ready for this sign and took the appropriate road, only to be halted by a line of traffic that was stopped dead in its tracks. With a sinking feeling, I suspected this was, in fact, the queue to the palace. So much for getting here early. As we sat, and sat, the sound of sirens soon pierced the sounds of engines humming and car doors slamming as frustrated drivers got in and out of their cars to assess the situation. Soon policemen on motorbikes were around us and there was a whole lot of Portuguese being spoken at high decibels, none of which made it any clearer for us to have a clue about what was actually happening. Soon thereafter everyone got back in their cars, engines revved and reverse lights were illuminated. Looks like we were going to have to back up. I should have noted that we were on a hill, on a tight road, with stone walls on both sides of us. Slowly, we all backed down the hill. I always love these moments when you are sitting in a large motorhome or campervan. They never seem to happen to us when we are in a conventional vehicle. With much time now passed, we made the decision to not continue up another road as we were convinced the ability to park would have been extinguished long ago. Back down on the edge of the town, we found an off-street car park and then spent another decent amount of time trying to work out the parking meters. Thanks to a lovely local who commented “parking meters are stupid in Portugal”, we realised we needed the correct money and it needed to be in certain denominations, none of which was depicted on the machine in any way. We jumped on the bus, buying a return ticket and sat back and watched some of the city that we had already passed a number of times this morning, once again. The Pena Palace is definitely worth visiting and the best tip I can give is to get there as early as you can. The middle of the day can see it swarming with high numbers of visitors. Being able to get inside and see the rooms with only a few people is the preferred option. On the subject of parking, I can confirm that there is quite a bit of parking along the roadside, large enough for campervans and motorhomes. It’s all free parking too. Once again, getting up there early will secure you a car park and at a spot closer to the palace. Despite giving up the opportunity to do this for ourselves, we still saw heaps of parks up there when we drove by on the bus. From Sintra, we drove on along the west coast of Portugal, passing through many of the small beach towns along the way. Before making Nazaré our final destination for the day, we checked out Ericeira. Like many of the towns along this part of the coast, they are all about the beaches and the waves. The blue Atlantic ocean and white beaches provide an inviting backdrop, as do the buildings that line the high cliffs. These areas of Portugal are known for producing some huge waves, some of them have, at times, been the largest in the world. At Ericeira, the city hangs on the edge of sandstone cliffs, fortified by bricks and blocks. Down below, striped umbrellas signal it’s summertime, as do all of the families frolicking about in the water and on the sand. We couldn’t come to Nazaré and not hang out for a while. Like Cascais, it’s an old fishing village, and for the most part, still has the old-world charm covering it like a cloak. Similar to Ericeira, there’s a high cliff that overlooks the city and the entrance to one of the best surfing beaches in Portugal is here also. Much closer to the water, there’s a promenade, perfect for those who want to take a leisurely stroll along the ocean front. Here, you’ll see fisherman drying their daily catch and the wooden boats that are used by them. The boats, with their eyes painted on the front to ward off superstitious events, remind me of those used in Malta. The promenade is lined with shops and cafes and parking for vehicles and campervans is easy enough here. Nazaré saw the world’s largest wave (35 metres) surfed here in January 2018. Our overnight location was hard to beat. Perched high up, and safely, on the edge of the cliff, we had sweeping views across the town and the ocean. Coimbra was one of my favourite cities in Portugal. An old medieval city, with a university to match, there’s plenty to keep you occupied here. On one side, a modern city blends with the river, offering water sports and a green space that is filled with people playing, drinking and eating. On the other, the city is full of small laneways, centuries-old buildings and plenty of history. It’s also a very hilly city, with the university located right at the top. It’s a worthwhile trip just for the views, but the university is something special. Overnight we stayed at a dedicated motorhome and campervan park by the river. It was hardstand, with some water and waste facilities. Access to the city is via the bridge and will take approximately 15 minutes, or a quick bike ride. After leaving Coimbra, we wanted to position ourselves to be close to the Douro Valley so that we could explore the next day. One of the great aspects of doing a road trip in Europe in Summer is the usability of the days. With long hours of sunlight and a lengthy twilight, you can drive much later at night, not that we really did too much of that. Before we got to Lamego, we stopped by Aveiro and I wouldn’t have missed this for the world. Every country, every region seems to have their own version of a mini Venice. For the Portuguese, Aveiro is theirs. Bright wooden boats called moliceiros ferry large numbers of visitors around channels. Tour guides provide some general commentary as they pass by the key features of this town. Aveiro is also well known for a seafood restaurant linked to the fish market, which we were more than happy to test out. Coming soon: More details on the beaches of Portugal, Coimbra, Aveiro and Lamego. Lamego sits within the Douro Valley, nestled amongst its slopes. It’s a town known for a cured meat called presunto and sparkling wine. Both must be tasted! Lamego, known for the church that sits aloft around 600 steps is the feature of the town. The steps are decorated with traditional Portuguese tiles. We climbed every step, in the heat, but it’s a climb that must be done if you can. The church at the top is beautiful as are the various fountains along the way. We parked at a large carpark overnight near the Centro Multiusos de Lamego ( a sports centre). It’s a large carpark in the centre of town, and adjacent to the church steps. Parking is free and there are hundreds of spaces. It’s safe and well lit. The Douro River runs for almost 900 kilometres, from the middle of northern Spain to the Atlantic via Porto in Portugal. Despite its length, only a small amount of the river is actually navigable. Through these parts, the riverboats take guests on a scenic cruise amongst the vineyard-covered rolling hills. We couldn’t drive the west coast of Portugal and not take a peek at the Douro Valley and sample the wine and port. Taking a road trip through the Douro Valley is highly recommended. Take it slowly, the roads won’t let you go fast anyway. Wind your way along the river as it snakes and turns. Stop in at the little villages you see along the way or pop into one of the many vineyards you’ll find along the way. Our favourite town in the Douro Valley was Pinhão, located right on a bend in the river, where some of the river boats dock. The town is very small but it makes for a perfect spot to have a coffee or lunch as you overlook the water. We came also for the railway station which has some beautiful hand-painted tiles. Unfortunately, we were not able to access the room upstairs which (so we are told) has an incredible display of Portuguese tiles. We stayed overnight at a very pretty spot on the Douro, at the marina in Eja. Porto has come to the attention of millions of visitors over the past few years and rightly so. Known for its colourful images of buildings that line the water and a magnificent bridge, it draws people to it like moths to a flame. Porto is so much more than this, and you need a few days at least to be able to really do it justice. Porto is definitely somewhere you don’t want to miss if you are heading to Portugal. Since Porto was our final destination and we had planned to stay several days, we found a great location just outside Porto that was both our daytime parking and our overnight location. It meant that our days were free of hassles of worrying about where to park the campervan and whether it would be safe or not. Incidentally, parking in Porto is not something that can be done easily in a large vehicle. This area is provided by the local council and whilst it is mixed use, contains areas large enough for large motorhomes to park. There are also motorhome waste facilities here. Across the road is a tram stop. We used this to get into Porto every day, taking around 3o minutes to get into the city. This was our final day on our eight-day road trip through Portugal. It was a relaxed trip, with no driving issues or vehicle issues to speak of. Portugal is a very motorhome/campervan friendly county. They provide good services in so many locations to allow those who are on a road trip to park easily, stay overnight or have access to facilities. No-one looks at you strangely, even in such a bright looking vehicle, when you park next to a car in the main street of a town. They actually welcome you. Of course, all of this will only continue if those who choose the road as their way of travelling, continue to look after the locations they stop in. Litter and rubbish in some parts of Portugal is a problem in general, but we didn’t see anyone in camping locations who looked as though they were contributing to the problem. Driving from Lisbon to Porto can be done easily in a day in a traditional vehicle. If you’ve got more time to spare, seriously consider hiring a campervan and live as we did. It’s great fun. We saw so much of this country during this time but still only drove 720 kilometres, allowing us to spend quality time in the locations we chose. The average kilometres was 90 per day but some days we didn’t drive at all or did very little. The largest driving day was only 199 kilometres, and that was split over several stops. We got a great deal with Westcoast Campers. In addition, we had a bedding kit (a sheet, doona and pillowcases), folding chairs and table and a chemical toilet. The campervan was a Renault Trafic 2.0, an older model, probably 2013/2014. As such, there is an obvious impact on fuel economy but it was nothing significant. The economy was slightly less as a result of driving through the Douro Valley. As I’ve already mentioned, Portugal is one of the best countries for campervan travel. It’s easy to get around, and they are not into the heavy policing of campsites or wild camping spots. We chose to rough it, given we had our facilities on board. As a result, we stayed in some of the most beautiful locations in Portugal. We travelled in June so there was still low numbers of visitors around. By July and August, summertime brings in many more, meaning getting a great location is put under more pressure. If you are more comfortable with official campsites, this website is a great resource. There’s another reason why everyone loves Portugal. The weather! With the better part of the year bathed in sunshine, you can road trip virtually all year round. From the middle of October until April or May, you will find fewer people on the roads and the prices for rentals will also be cheaper. Booking vehicles and campervans in the peak months of June through to September will attract much higher rates and more demand, so remember to book early.